* Book 4 contains selections for early-advanced pianists. * Titles: Arabesque No. 1 (Debussy), Bagatelle in E-flat Major, Op. 33, No. 1 (Beethoven), Doctor Gradus ad Parnassum (Debussy), Fantasie in D Minor, K. 397 (W. A. Mozart), Golliwog's Cakewalk (Debussy), Nocturne in E-flat Major, Op. 9, No. 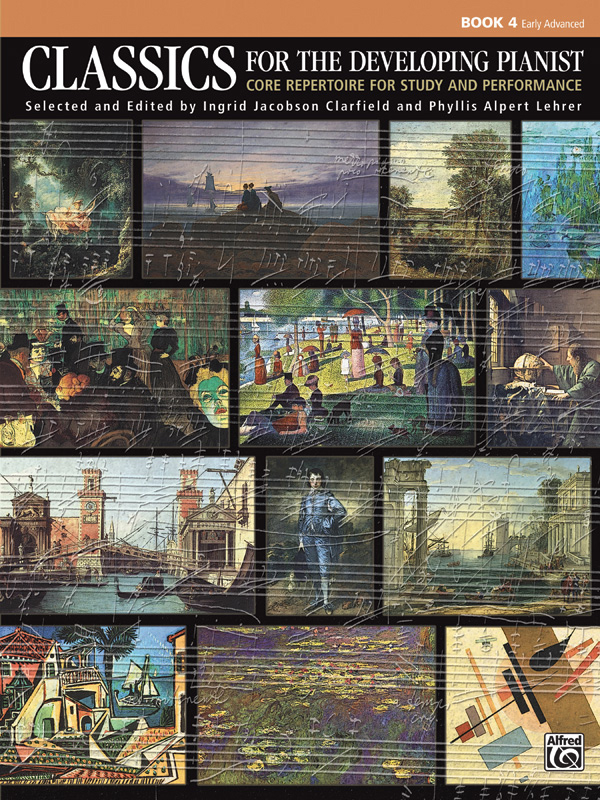 2 (Chopin), O Polichinelo (Villa-Lobos), Prelude in B-flat Major, BWV 866 (from The Well-Tempered Clavier, Vol. 1) (J. S. Bach), Prelude in D-flat Major ("Raindrop"), Op. 28, No. 15 (Chopin), Sonata in A Major, K. 208; L. 238 (D. Scarlatti), Sonata in A Major, K. 331 (III: "Rondo alla Turca") (W. A. Mozart), Sonata in C-sharp Minor ("Moonlight"), Op. 27, No. 2 (I) (Beethoven), Sonata in D Major, Hob. XVI/37; L. 50 (I) (Haydn), Sonata in D Major, K. 430; L. 463 (D. Scarlatti), Sonata in G Major, Op. 49, No. 2 (I) (Beethoven), Spanish Dance, Op. 5, No. 1 (Granados), Traümerei, Op. 15, No. 7 (Schumann), Venetian Gondola Song, Op. 30, No. 6 (Mendelssohn), Waltz in C-sharp Minor, Op. 64, No. 2 (Chopin), Waltz in D-flat Major ("Minute"), Op. 64, No. 1 (Chopin).